Pair of (2) Navy Blue Gingham Check Window Valances! Valances sold in pairs of (2) 40" wide valances for a total of 80" in width. 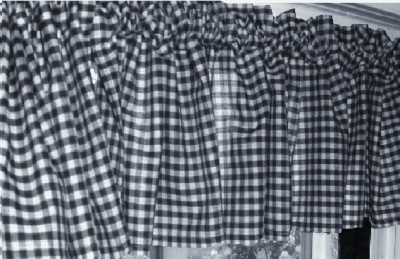 Easy care Polyester/Cotton 1/4" gingham check window valance. Valances with 1.5" or 3" pocket for rod and 1.5" header above the rod. Straight edge bottom, with or without optional easy care white polyester/cotton washable lining. Retro Vintage Gingham Check Valance. These are wonderful vintage style Gingham Check Valances that will brighten and soften any room! Navy Blue Gingham Valance for Windows. Made in USA.